Rhulani Safari Lodge is a place of calm and adventure in the Big Five Madikwe Game Reserve, 4½ hours from Johannesburg and Pretoria. Be captivated by the wilderness on bush drives and walks, and nourish body and soul in between. The rock pool and its tree-shaded lounging deck is a wonderful place of respite in the heat of the day. 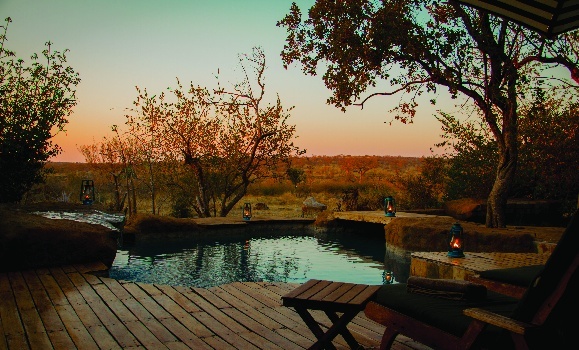 The Madikwe wilderness is vast – all of 75 000 hectares – and teems with wildlife and birds, without any risk of malaria. A handful of chalets have warm, inviting interiors, and decks of their own with plunge pools. Families with children are welcomed into a private two-bedroomed suite. STAY 3 PAY 2 SPECIAL OFFER: Get your 3rd night free, subject to availability and inclusive of accommodation, all meals and guided safari activities. Valid for travel during May and June 2019. Rhulani's conference centre accommodates up to 30 delegates around a unique leadwood conference table.